Daughter of the tea merchantElizabeth Twining was one of nine children born to Richard Twining (1772-1857 and his wife Elizabeth Mary, nee Smythies (c1780-1866), banker and tea merchant. 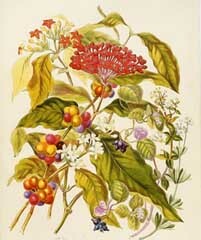 She wrote and painted various botanical works of which the most remarkable was 'Illustrations of the Natural Orders of Plants'. Apart from this she promoted many philanthropic and educational schemes. She was the first to organise "mothers meetings" in London and took part in founding Bedford College for girls. 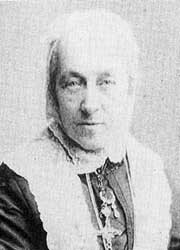 Her sister, Louisa (1820-1912), followed a similar path of philanthropic endeavour in London. While living at Dial House, the old family home in Twickenham, she restored the parish almshouses and established St. John's Hospital. 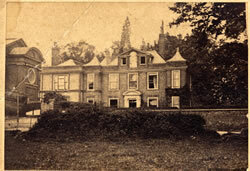 By her will, Dial House was given to the people of Twickenham for use as the vicarage. Her writings include, Ten Years in a Ragged School and Readings for Mothers Meetings. There is a plaque recording her gift to the almshouses on the outside wall of the south staircase of St Mary's Church. Recently restored and now re-sited, it had for many years been fixed to the north-east wall of the churchyard. the first to organise "mothers meetings"